I know that not many people make popcorn the old-fashioned way anymore, even Kettle Corn can be made in the microwave these days. But please, please give this stove top kettle corn a try. It’s easy, and it seriously blows the microwave stuff out of the water. Trust me. Make this popcorn. I made a discovery a couple years ago that I really have been meaning to tell you about. Honestly, I can’t believe I didn’t write about this before now. But here it is: instead of popping your corn in oil, use clarified butter or ghee. 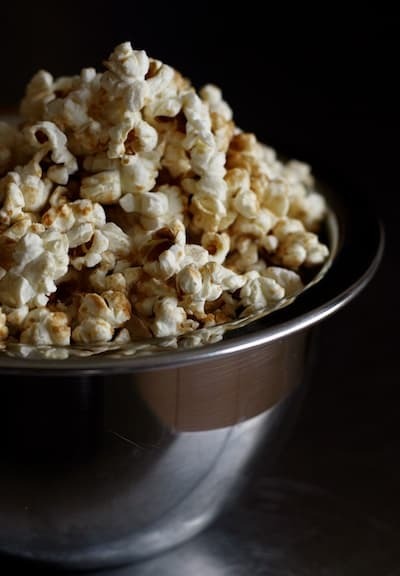 While regular butter would burn if you tried to use it for popping corn, ghee has a much higher smoke point and works perfectly as long as you pop the corn over medium heat and watch it closely. I love making Indian food, so I almost always have a container of ghee stashed in the pantry. But for those of you who are new to using it, ghee is easy to find at ethnic markets or on the shelves of well-stocked supermarkets. It’s also easy to make at home. If made properly, ghee can be stored at room temperature just like cooking oils. But if storing at room temperature, be sure to keep moisture out of the container and never dip into it with a wet spoon, as moisture will cause the ghee to spoil. The ghee in this recipe adds a richness to the sweet and salty kettle corn that just can’t be replicated using oil. You can substitute oil for the ghee in this recipe and still end up with some tasty kettle corn, but I hope you’ll give my version a try at least once. Heat ghee over medium heat until melted. Add three popcorn kernels, cover with a lid and wait and listen until all three kernels have popped. Add the rest of the popcorn kernels, shake to distribute then sprinkle sugar evenly over the kernels. Cover with lid and listen for popping. As soon as the kernels start to pop, shake pot gently back and forth over the burner, lifting it up and shaking from time to time, until the popping slows to every 2 to 3 seconds. As soon as the popping slows, remove pan from heat and immediately dump kernels into a large bowl. Sprinkle lightly with salt and toss with a wooden spoon. Taste, and add more salt if desired. Serve immediately. *you may substitute vegetable oil for ghee, if desired. This sounds wonderful. I only recently found your site, but already I have a list of recipes to try! Why do you do just three kernels first? Just made your pumpkin cheesecakes for my family get together. They were absolutely fabulous. I want to post them on my blog with a link to yours and write about how great your blog is.. I only took a photo of the end product. I loved using the mini pan too. .
Yum! I can't wait to make this! i love kettle corn and love making popcorn on the stove! This will be fun to try this holiday weekend! I hadn't thought to use ghee before and look forward to experimenting with it. I love making stovetop popcorn and discovered that olive oil also imparts a fantastic, rich flavor. This brings back wonderful memories - quite the best and simplest way of getting great popcorn. I think I haven't commented a lot lately - but this has me craving kettle corn like you would not believe. I think I'll make this tomorrow to tide the kids over until it's time for the big dinner! I completely lost my taste for microwave popcorn when I was pregnant (10 years ago, now), so we make popcorn the old-fashioned way or no way. I'm definitely going to try your way with ghee. I may even make this kettle corn today since I have my urchins at home today with very little constructive use . . . the ghee will have to wait until next time, though, because I have pies, breads, and oh so many other things to create today. Thanks! We love homemade kettle corn. I will have to try it with the ghee. Thanks for the recipe! Looks and sounds great. Perhaps I am missing this but when do you add the sugar? Never mind, I do see it. This is going to sound so silly, but I make popcorn on the stovetop often, but have refrained from making kettle corn because I thought a regular pan wouldn't do... that I needed a kettle! lol Making this ASAP! I love kettlecorn and have always wanted a good recipe to make it at home, thanks! Ah, memories! Old fashioned kettle corn at the fair. I have made many batches of Thanksgiving popcorn from my site in the last week. But I have never tried to make kettle corn, but now I know I will. It will probably make me crave pronto pups and funnel cakes! Oh yum! Do you have a recipe for cheddar or caramel popcorn? I'm getting a craving now! Hi Nicole, I love popcorn...never tried making this way...it looks delish! I used to eat kettle corn all the time in college - I need to try to make some homemade kind - looks yummy! I don't know how you do it because every time i try to add sugar to my popcorn while it is still in the pan it burns. I just bought some kernels and been looking for a way to use them - this sounds perfect. Do you have a brand of ghee you recommend though? I've never used it before. I LOVE kettle corn and always wondered how the heck to make it so the butter and sugar wouldn't burn. I will give this a try for sure, as I already do my popcorn on the stove (microwave popcorn is just wrong). I learned about ghee in school (IIN) but have yet to try it. Now I have the perfect motivation. Thanks! is the title inspired by the frightened rabbit song? if so, awesome. if not, listen to it! Have you tried using coconut oil? It also has a high smoke-point and works very well for popcorn. The popcorn stays crisp for a longer period of time, too. Thank you for making a post helping save popcorn. I love popcorn and the microwave stuff makes me cry. All preservatives and nasty fake butter. My favorite way is the wok and shaking violently method.Oh yeah good idea on the ghee...(insert homer drool here)....p.s. bba updates???? hehehehe don't worry we have been slacking too. First time: made it w/coconut oil (no ghee available at the time) and raw sugar. Turned out really good.Second time: made it w/grapeseed oil (again, using what was available) and brown sugar. BUT, I also topped it w/melted butter before eating. It was really good as well.thanks again for this recipe and hope to try it w/the ghee one day. Thanks for the recipe.. I want to try it. I'm also a fellow San Diegan.For those who dont have ghee, it is easy to make ghee from the butter. Just google for the ghee recipe. My way of making is: I put a pound block butter in a heavy bottom pan, and simmer it for about 20 min watching closely, stirring once in a while. (if you dont watch closely, it might overflow). The butter boils and clarifies to ghee, and brown particles settles down in the bottom of the pan. The texture of ghee looks like the golden color oil. You strain the liquid from the solids in the bottom to a clean container. This looks like a great recipe for kettle corn! One question: will it still taste like kettle corn if I coat the popcorn with sugar et al after I pop the popcorn? I just made some kettle corn in my new air popcorn machine.... and it was better than awesome! I added butter and the sugar in the butter melting cup and poured over the popcorn after it popped. I used Splenda "baking blend" and it tasted just like regular sugar! Wow what a great recipe. We love kettle corn and usually buy the microwave kind. However, with this recipe it seems as though we can upgrade to our own homemade kind! Thanks. This is the only way I make popcorn now but try it with a little paprika when you sprinkle the sugar on. It awesome if you like a little spice. I just made this with extra virgin organic coconut oil. I can't even tell you how good it is! The coconut oil gives it a slight coconut flavour. It is so delicious! All it took to get me off microwave popcorn was to read an article pointing out the ingredients in each bag which elicited a big "Ewwwwwwwww." Our penchant for faster and easier has definitely led to the more unheathly. Stove-top ever since! I've wanted to make kettle corn homemade for a while now so glad I came across your recipe. Thanks!